On the 1st of August we started work on this home cinema. We are converting an extra room that was planned to be a music room, into a high quality home cinema. 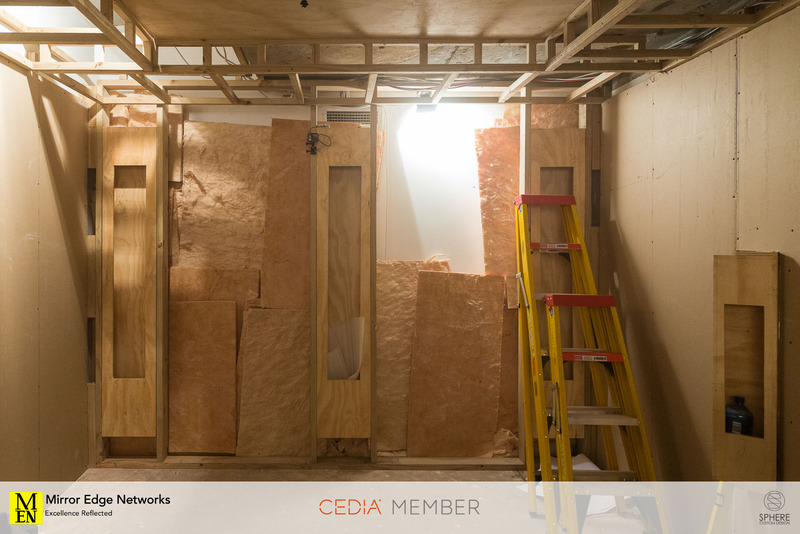 This is a behind the scenes look at the home cinema build. 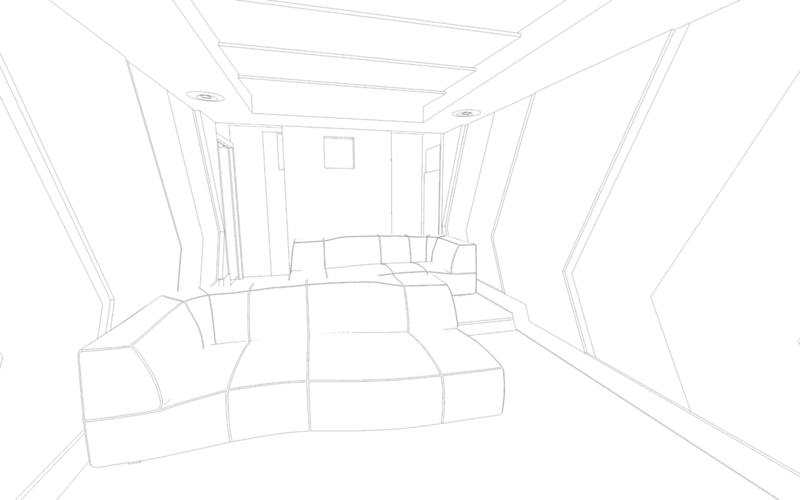 We briefly touch on some of the design elements and room measurements. If there are any queries about this home cinema build we welcome you asking them. 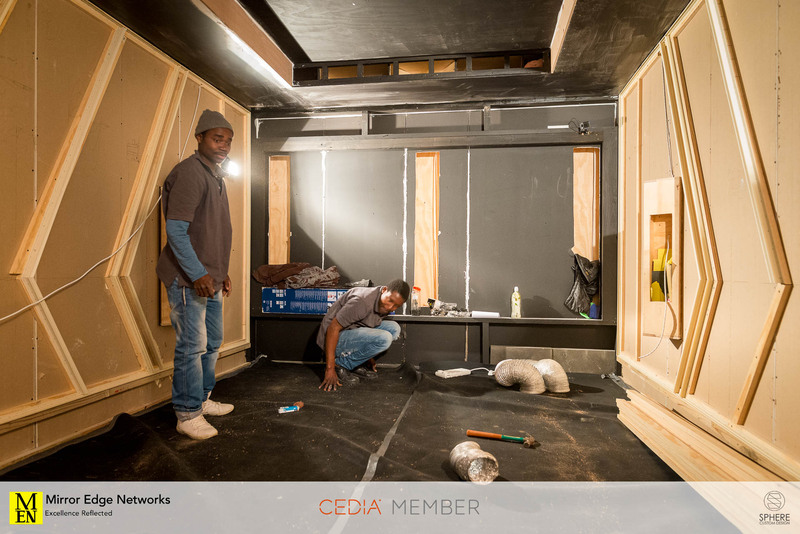 The cinema was designed by Christiaan Beukes from Sphere Custom Design, and the build of the room was lead by his team. 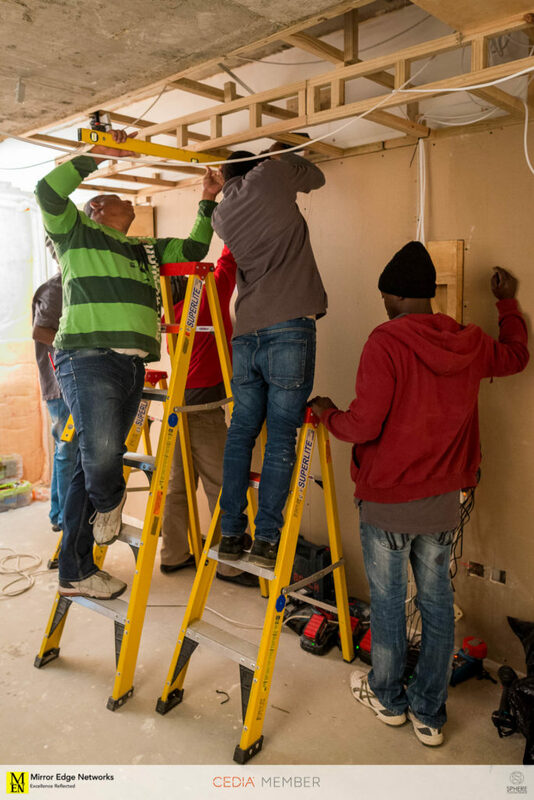 My team were on site too and assisted in the room build. 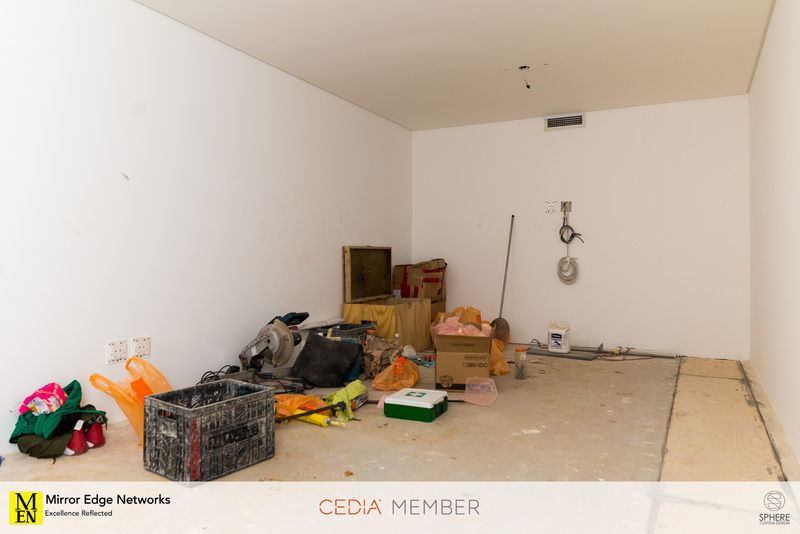 There are many different elements that have gone into this room, I will do my best to highlight the parts of the room build that I feel would be of interest or that caught my attention. I hope you enjoy the journey through this home cinema build. 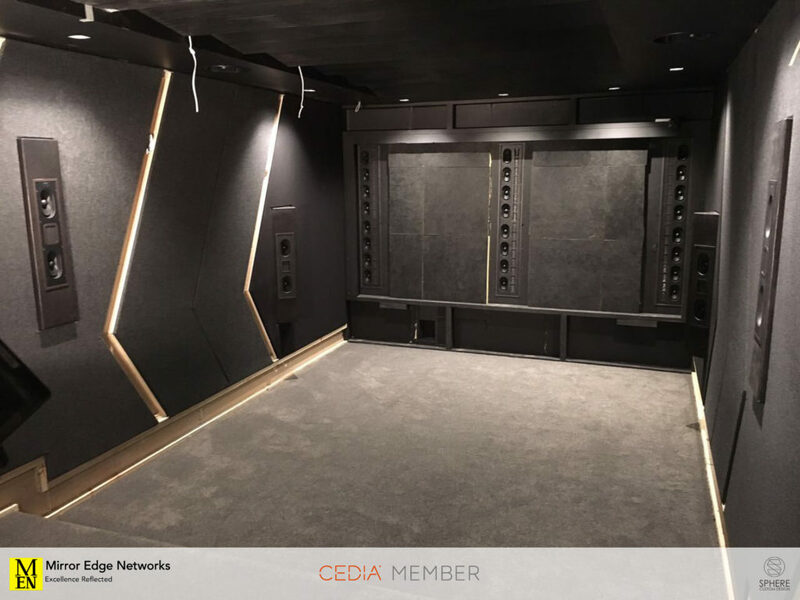 This is the first look at the cinema room, a recently completed room in the house build process. 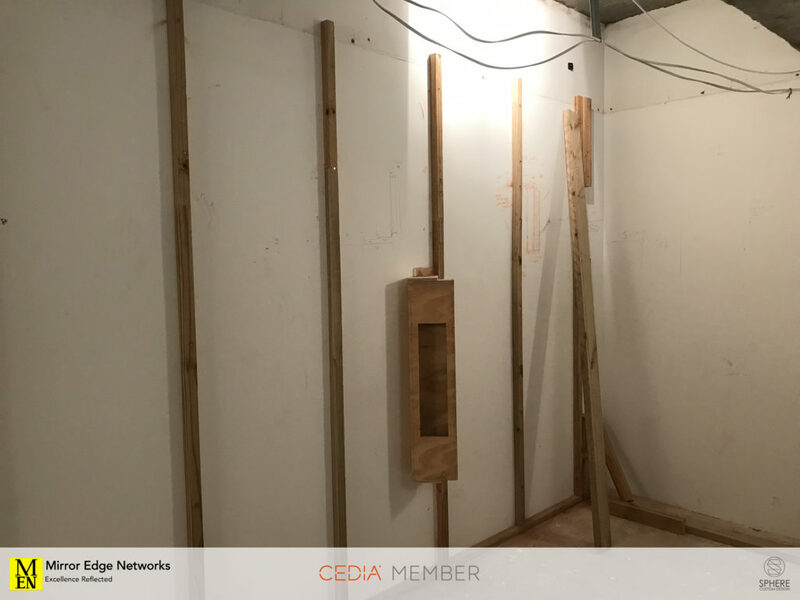 The entire cinema build process moved very quickly from the time of meeting the client to conceptual design drawings and the commencement of the home cinema build process. This picture is the view that will be into the room from the back row of seats. 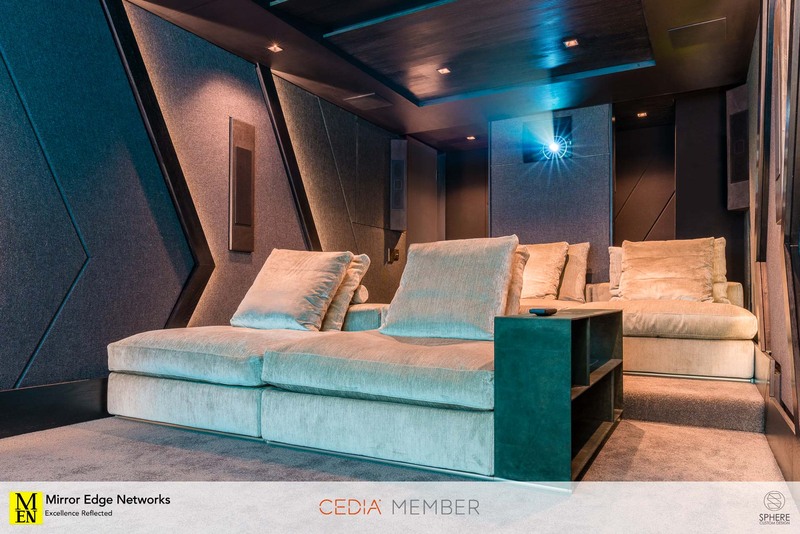 The home cinema is designed to have 2 couches as opposed to cinema seats as this would allow for the most flexibility of seating. The home cinema has various constraints for us to work with: The room itself is 7.2 meters long and 3.4 meters wide. 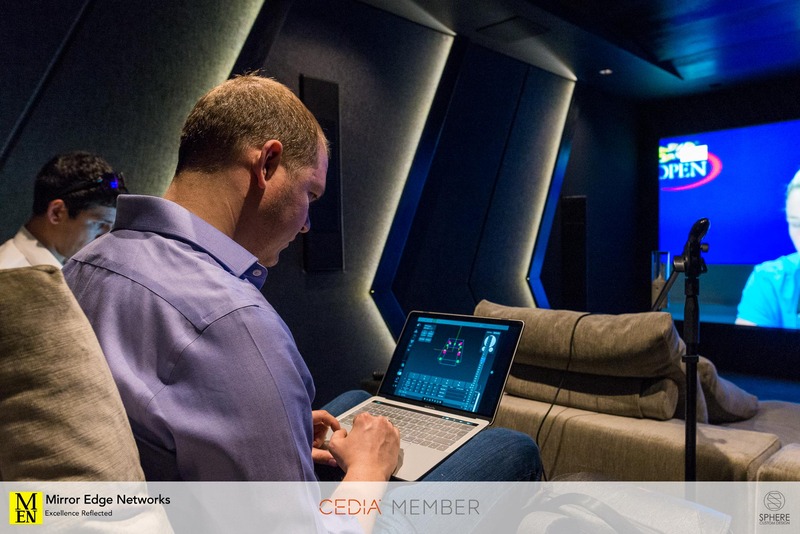 For us to make it into a home cinema with a functional audio stage we would have to shorten the room. So its possible to see a false wall behind the back row of seats. 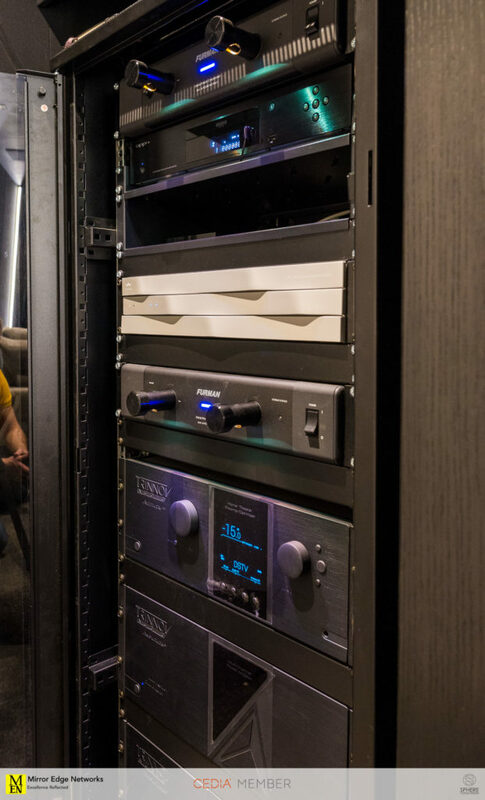 This also serves to assist us with dealing with another constraint of the room… Where to locate all the source equipment, processor, amplifiers and projector. 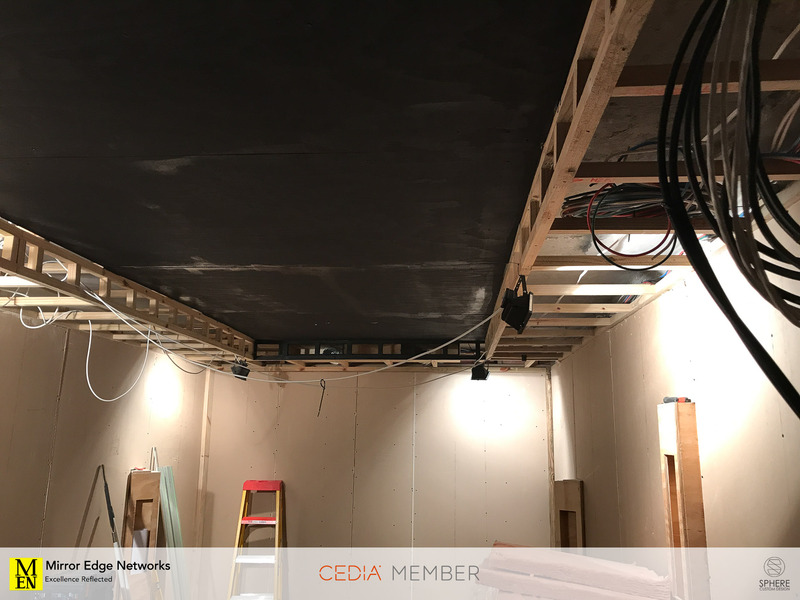 We used the space behind the wall to install a floor standing 27u rack and build a projector box that provides isolation for its noise, but still allows airflow for cooling. 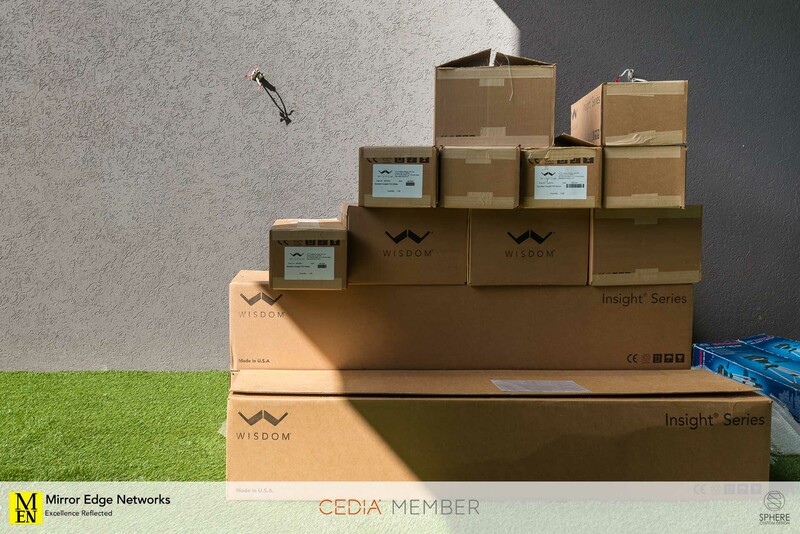 Stage one of this home cinema build…. “Day one” of construction work starts. We were told by the builder that there was a small cavity running on the left side of the ceiling that was approximately 200mm deep. We were very surprised to see that it was actually far more than that and realistically closer to 500mm deep (I didn’t get around to measuring it myself, but I am sure one of my staff did). 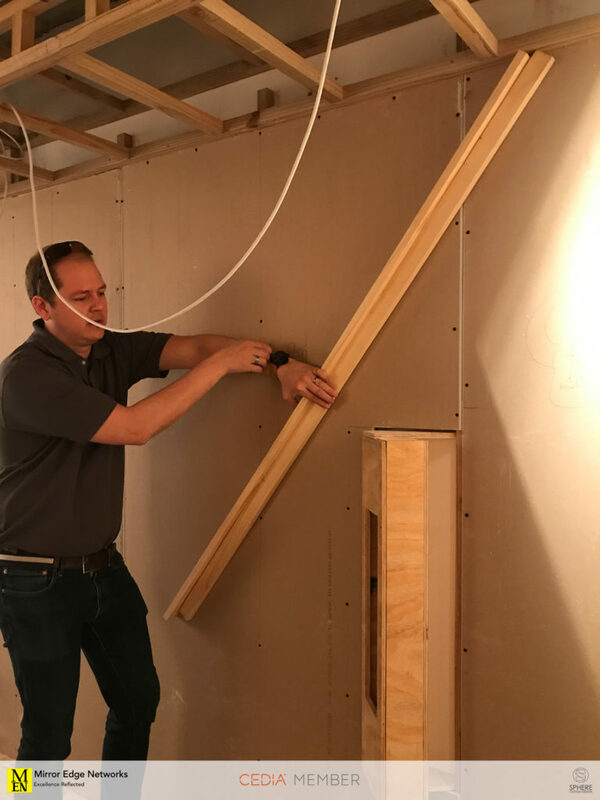 While this cavity in the ceiling potentially poses some issues acoustically, it could also be useful for a few other elements of the room like air conditioning ducting and venting the air from the self-contained air conditioning unit. 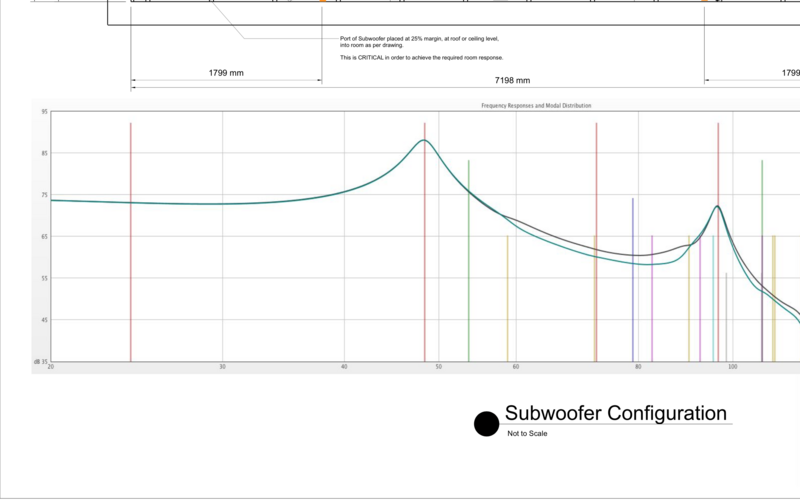 Before any construction work takes place we measured the low frequency response of the subwoofers within the room. The measurement kit used is a Home Acoustics Alliance measurement kit (HAA). 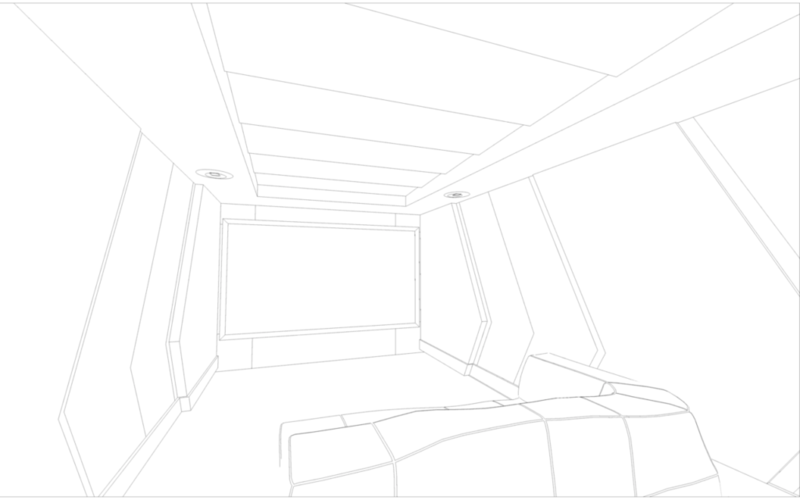 This would confirm the response that was generated from the room mode calculators while designing the cinema. 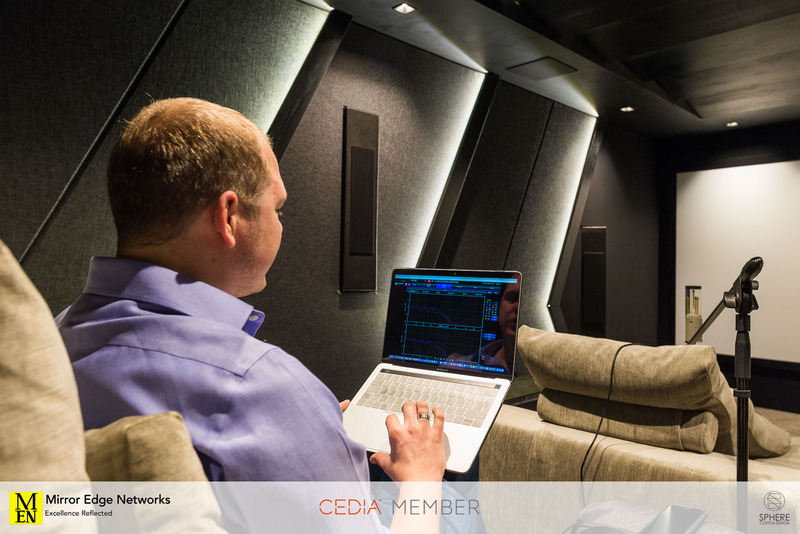 This will help us to confirm how much acoustic treatment is required in the cinema. On the right side of the room is a sewage / waste water cavity in the floor. We haven’t opened this yet, but we suspect that it is going to require filling as it creates a massive resonance in the room if you stamp your foot on it. We assume it is going to react the same way to bass frequencies. 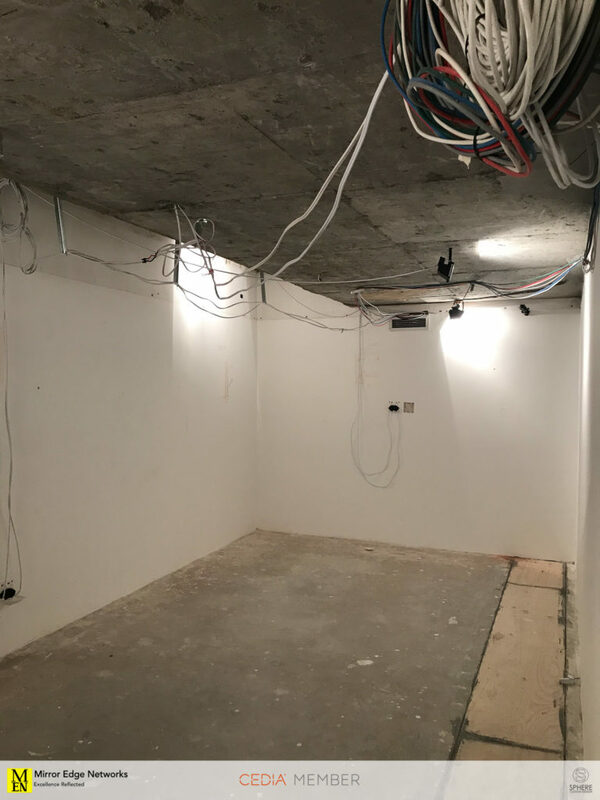 Its great to see what we are going to be working with on this project, its always best to start from a bare shell when building a home cinema of this quality at this level. 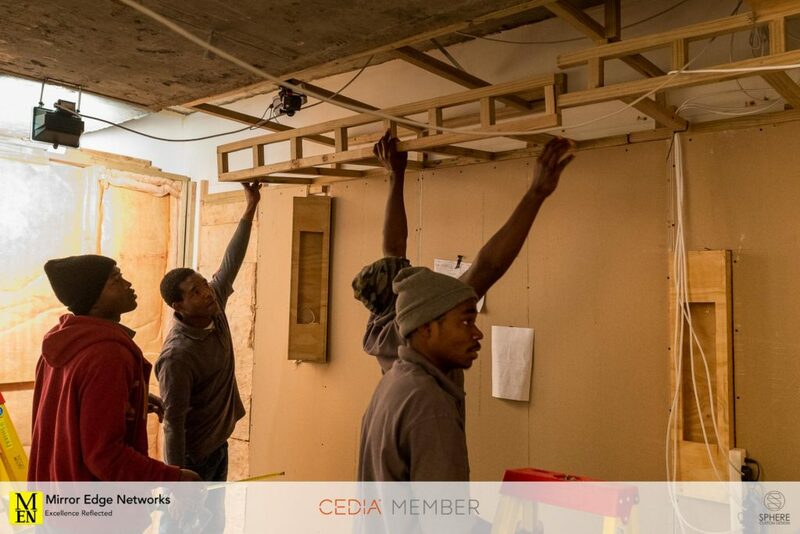 The drywall installation process commences by building the structure with timber batons. We use timber to eliminate the possibility of resonance within the cinema. 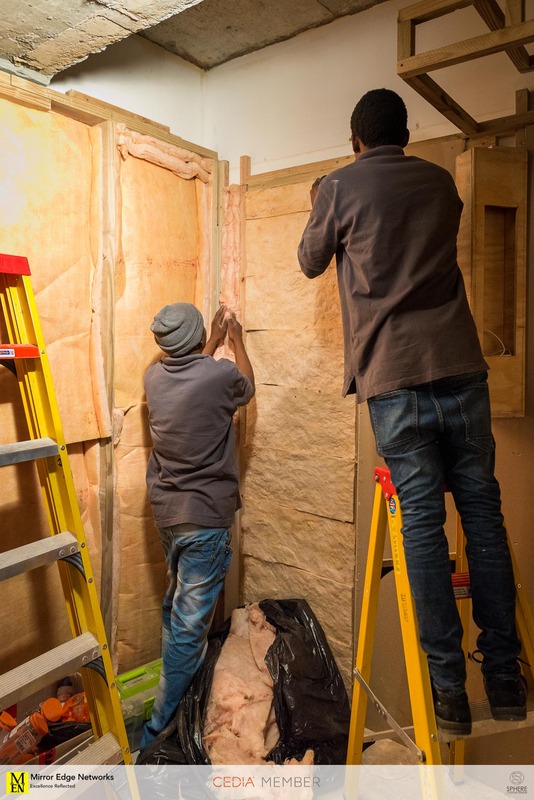 During the construction process we use timber wherever possible. 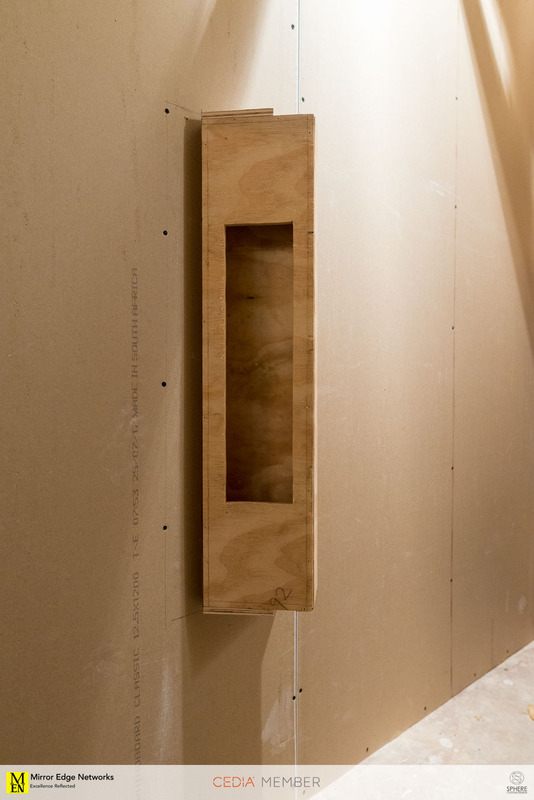 Before final installation, the front baffle wall is moved into place and test fitted to ensure that it has enough suitable mounting locations for the Wisdom Audio Left, Center, Right (LCR) speakers and the S90i Subwoofer. It is constructed as a prefabricated frame, screwed together and strengthened enough to ensure that there is no resonance on the front wall when there are some serious sound effects taking place. 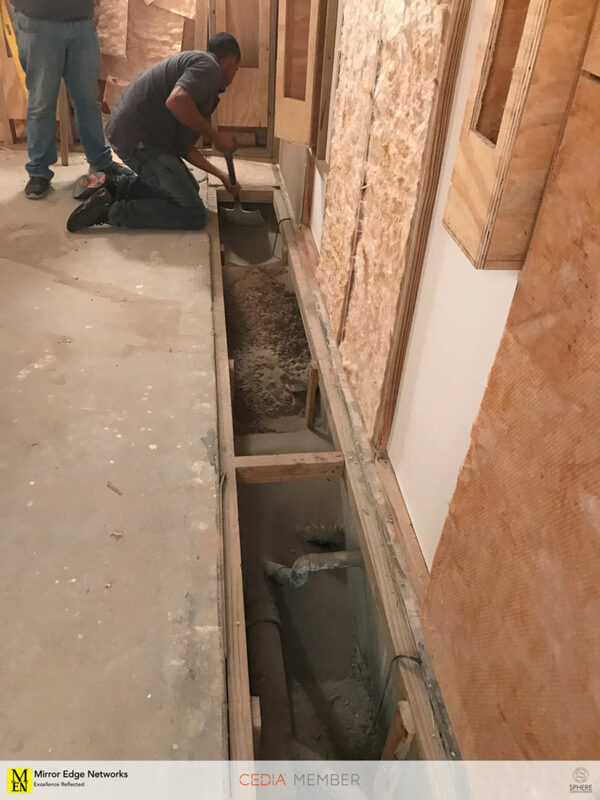 The lack of concrete slab on the left of the room was also a determining factor to ensure that the structure for the front baffle wall was as rigid and sturdy as possible. Without the extra place to ensure that the framing was anchored to the wall we had to make sure that the rest of it was as strong as possible..
Due to the special considerations of the bass response within the cinema, the Wisdom subwoofers have to be installed into the front and rear baffle walls in the a suitable orientation. This is to ensure that the bass frequencies produced by them are presented into the room at the correct planes to create an even bass response across the entire room. 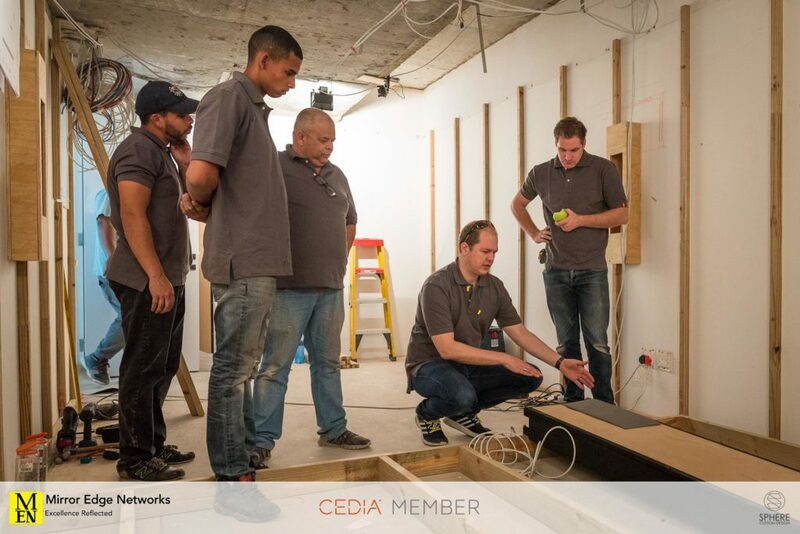 Here you can see us all listening to Christiaan Beukes (hunched down next to the subwoofer) listening to what he has to say about the speaker location and the way we will mount it to the baffle wall. For reference from left to right we have; Wesley Hesqua, Kyle Brown, John Hesqua, Christiaan Beukes, Morgan Irwin (me). 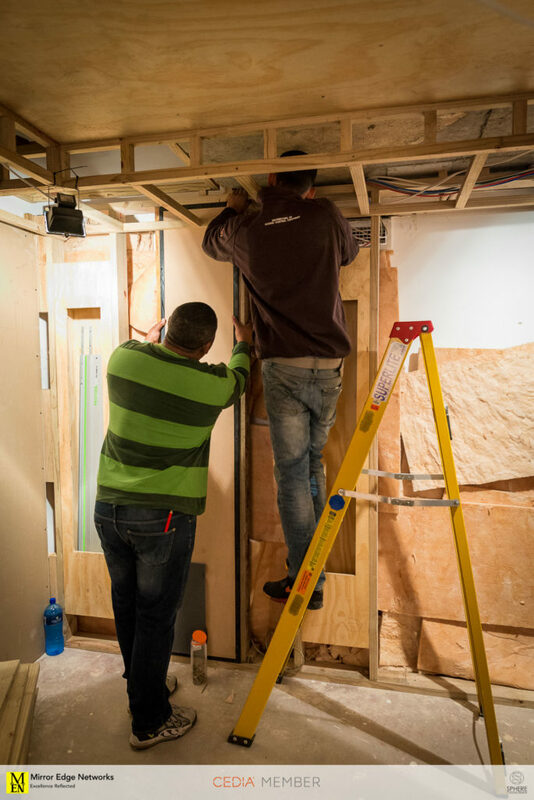 Once the framing for the front baffle wall has been installed and secured we carry out the final placement of the front speaker cabinets. As you can see we use our highly scientific measurement method The centre of the front speakers are located at the listening height of the front row of cinema seats. While the exact location of the centre of the speakers in relation to the listening position is not completely critical, we have done our best to ensure that it is as close to centre as possible. 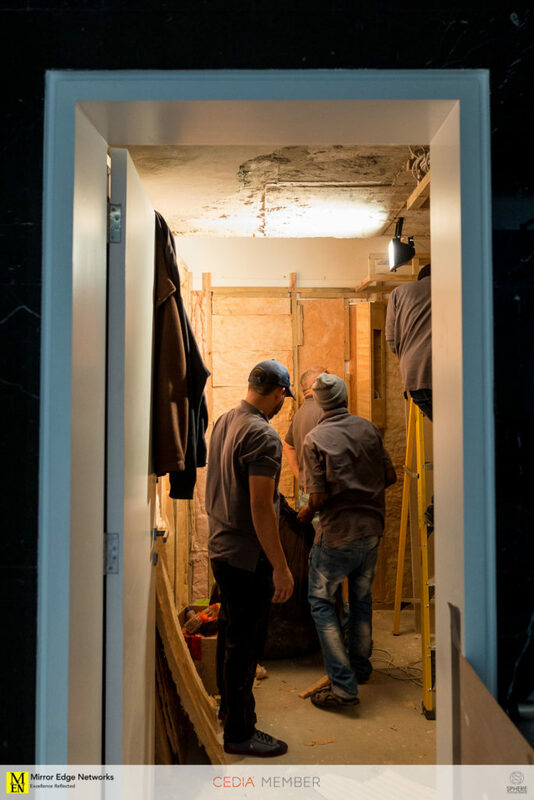 The speaker cabinets are mounted directly to the concrete internal walls of the room, this was to ensure that we maintain as much of the space of the room as possible. It is quite a challenge working in such a small room, but we are doing our best to economise on the space available to us. 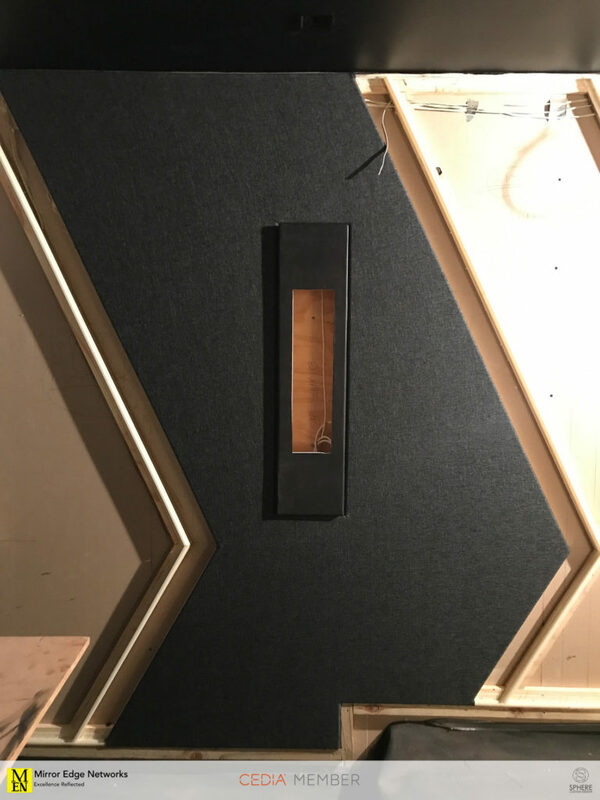 This is what the speaker cabinet installation looks like within the drywall, this is prior to the installation of the fabritrak and acoustic fabric installation. The speaker cabinets will be covered later in the cinema build process which is why they were constructed out of shutter ply. 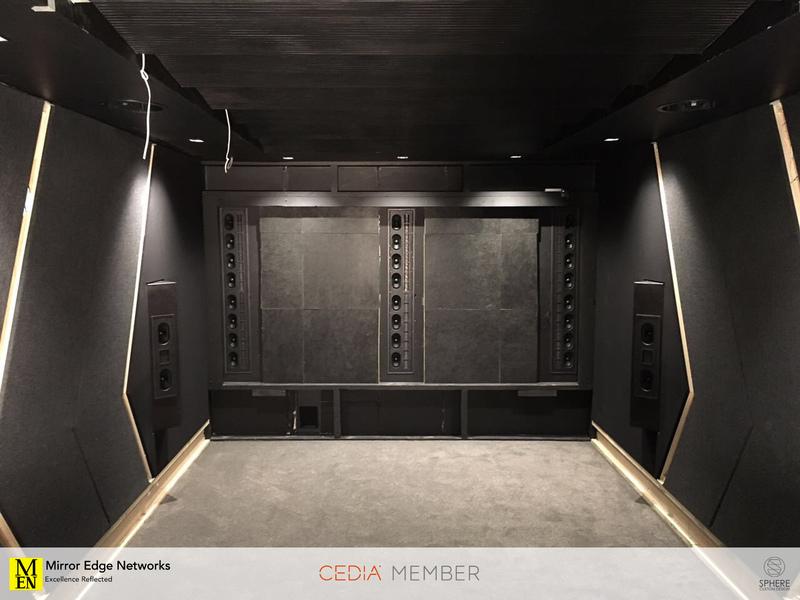 Mineral fiber insulation is installed into the baffle wall at the front of the room and the rear of the room for low frequency treatment, as well as to reduce structural resonance from the front speakers. For convenience sake, a section is left open to ensure that there is still a light reflective surface for our flood lights during the construction period. In this room a drainage duct for the house pluming ran the length of the room. To ensure that there was no acoustic resonance from this hollow duct with timber lid, we have filled it with silica grade sand. It was incredibly surprising to see how much of an impact the shallow duct had on reverb in the room. The 16mm shutterply lid of the duct would simply resonate the sound of any low frequencies back into the room. It was a difficult process filling the cavity with sand, 53 bags of 40kg of sand were emptied into the hole in the ground. This took me personally 3 trips back and forth to Kuilsriver to collect the sand for this. An inconvenient surprise to us on the project but something that we got on and dealt with so that the project could continue. 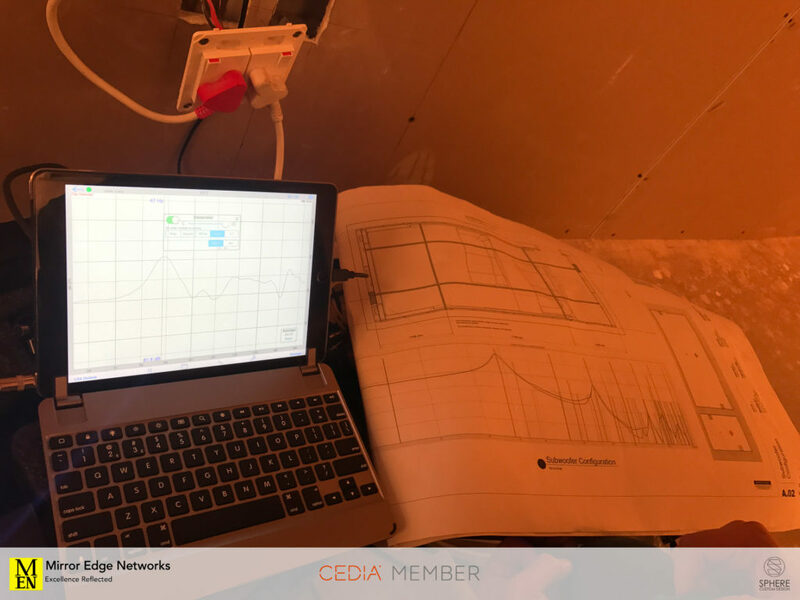 Before the installation of the final drywall into the front baffle wall we are back on site with the HAA test kit to measure the response of the room according to the original computer generated frequency response. We have found after measuring the response of the room that we have more energy than anticipated which is useful as this can be addressed in the room calibration software as opposed to trying to introduce more energy through room correction which would result in an inaccurate representation of the soundtrack of any movie or music. It is not completely clear in the photos, but the room has a smooth response up to 100hz which is where the plotted rolloff of the subwoofer begins. If you can see by the photo taken onsite of the HAA interface, the actual room response matches the computer predicted response very closely. 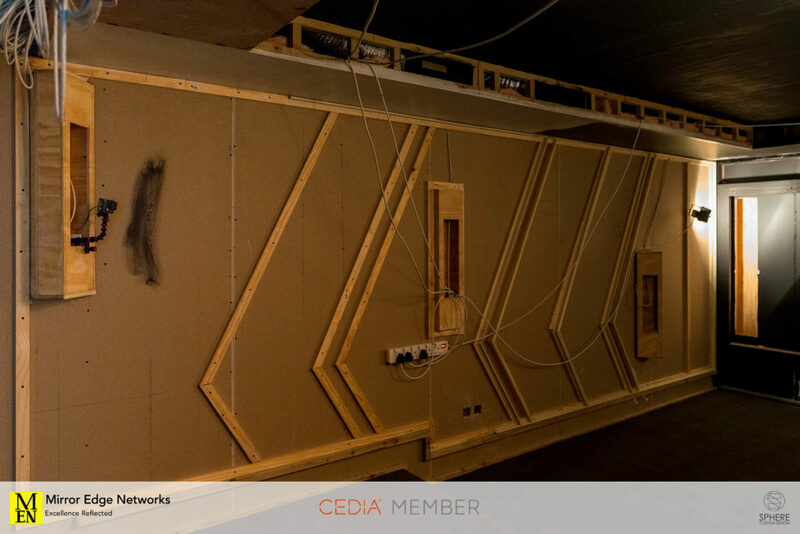 A change to the design of the timber chevrons in the front of the room is introduced while we are measuring the room and assessing the progress of the cinema build. This is to rather expose the surround speakers in the cinema as this will maintain the width of the room. 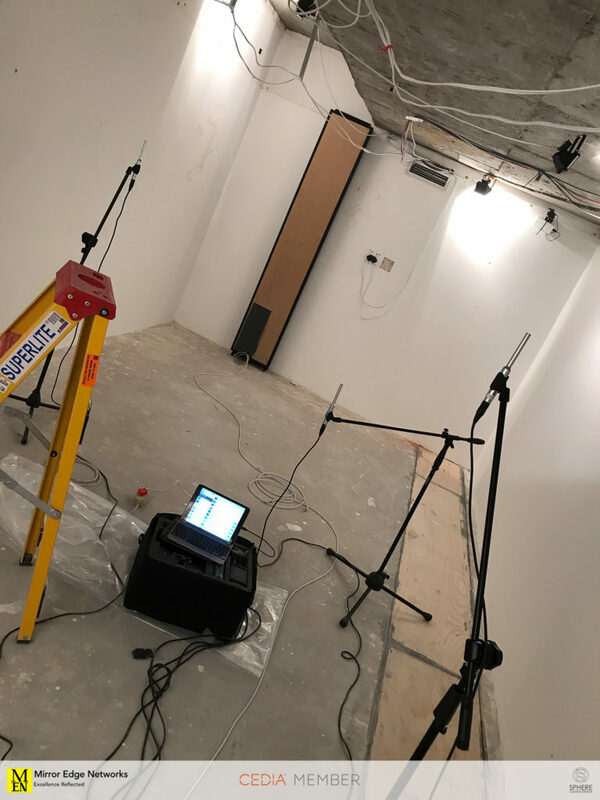 Time to get back into the room construction now that we have taken acoustic measurements and found everything is on track. 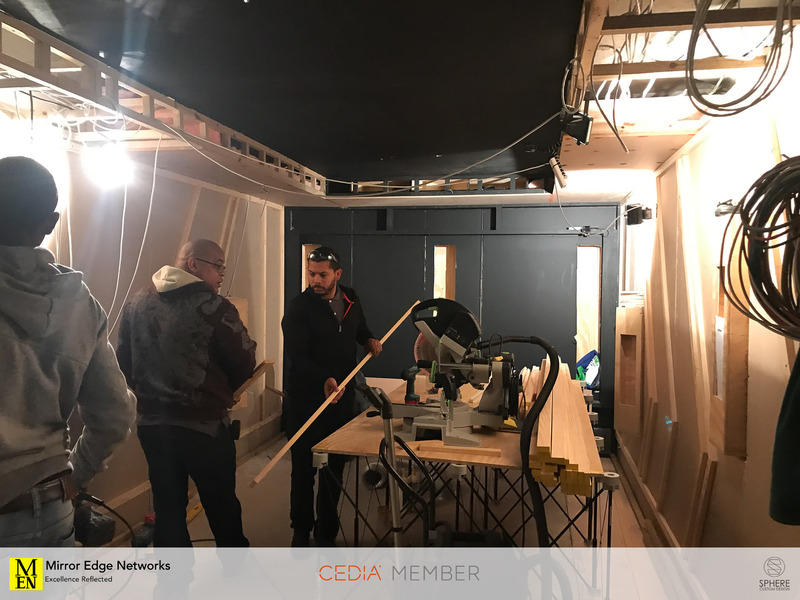 Our team of carpenters continue with the process of completing the timber bulkhead at the rear of the home cinema room. The most efficient way to construct these is to assemble them outside and bring in the frame work, mount them and move onto the next section. Of course in construction processes (referring more here to the actual brick and mortar room in this comment) there are going to be parts of the room that are not true and straight. 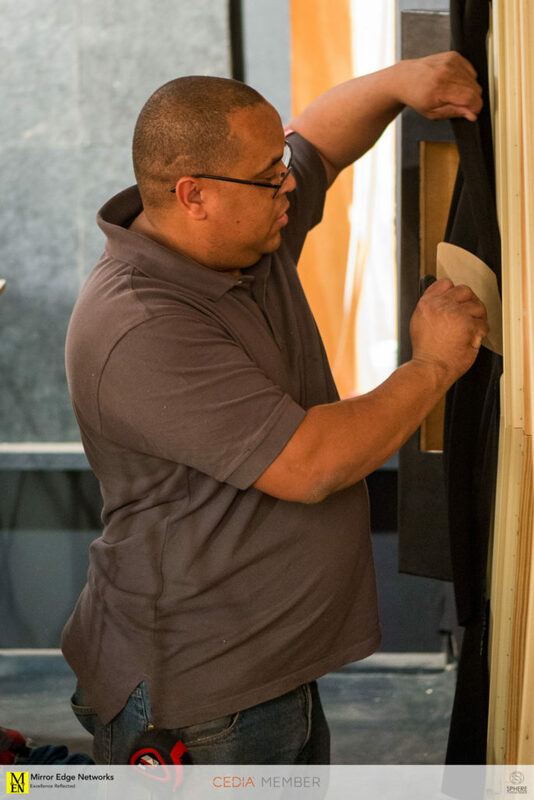 With that in mind Lionel has been constantly checking our construction to make sure that the finished product we present to the client is 100% perfect. 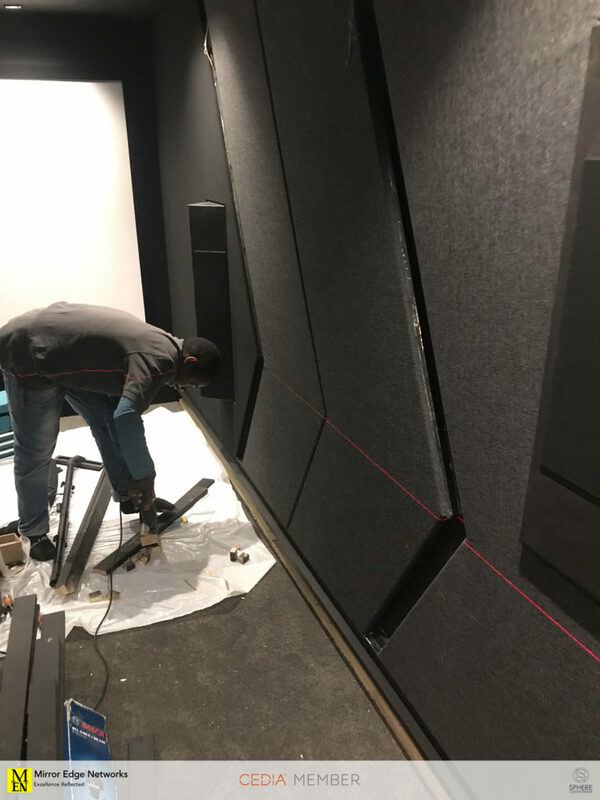 Now that the bulkhead structures are in place and secured its time for final installation of the Wisdom Audio subwoofers into the front and rear baffle walls of the cinema. They are not the biggest subwoofers in the world, and they don’t have the biggest drivers (2 x 6″ drivers) however the response of these speakers due to their unique Regenerative Transmission Line design and construction is phenomenal. 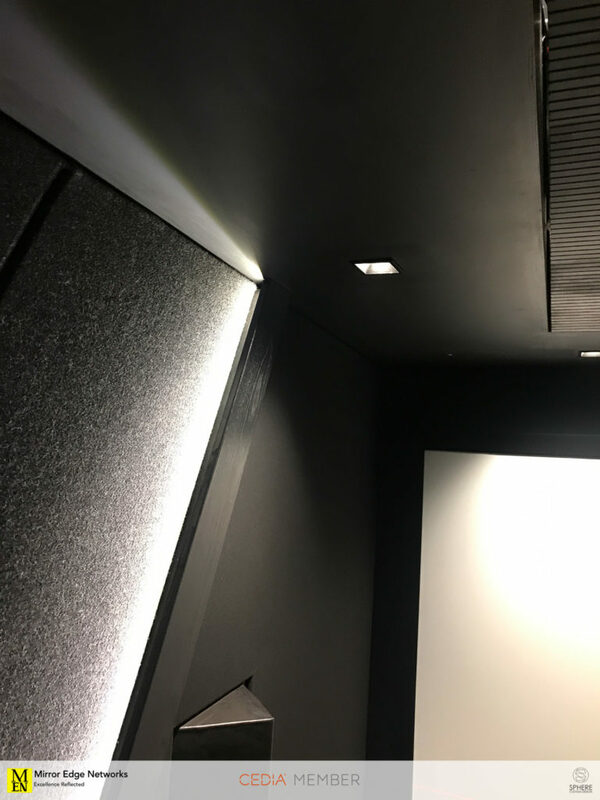 The drwyalling throughout this cinema build is filled with mineral fibre insulation to ensure that the audio response of the room is suitable. This is measured as an RT60 time, this is the amount of time that it takes for a audio frequency to decay. The mineral fibre installed is of varying densities around the room to cater for the low frequency response. Main construction of the room nears the rear of the room. 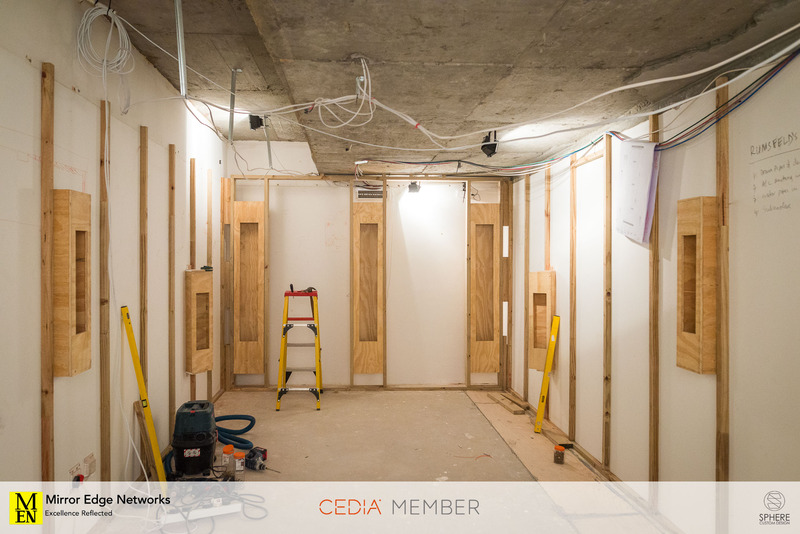 Once the structure and acoustic treatment installation is completed the final drywall sheets will be installed. Of course with any building work taking place these days, it is seldom that everything is going to be straight or square. To combat this, we have decided to install a shutter-ply substructure for the ceiling. From this we hang our acoustic ceiling boards. 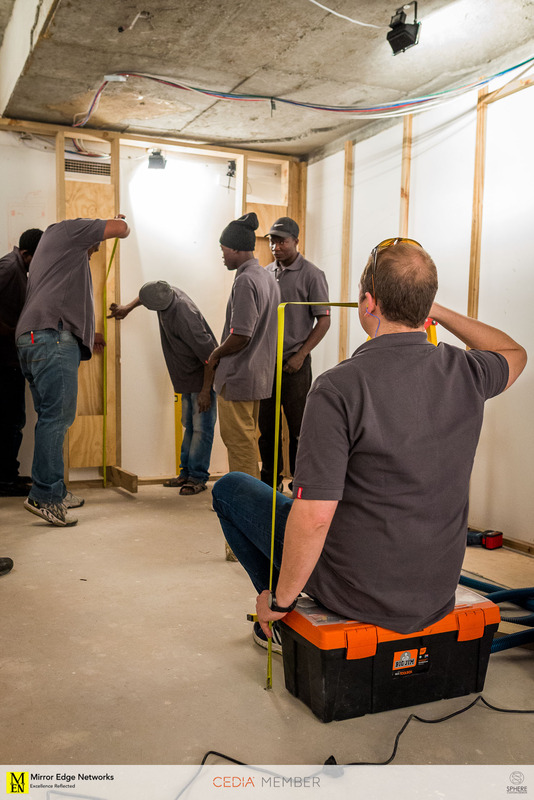 Here you can see some of our carpenters measuring to ensure that the shutterply boards are cut to fit in as tightly as possible. 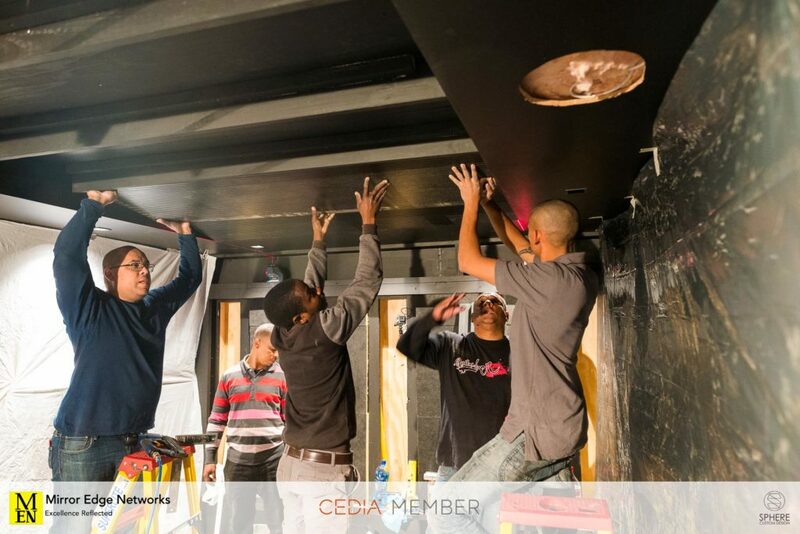 Installation of the final ceiling shutterply boards takes place. This marks quite an important point in the room construction where we can install the final drywall sheets and paint the entire structure of the room black. We construct the risers for our seating out timber instead of having them cast in concrete. The timber riser for the second row of cinema seats is built and now makes a platform for our tools over night before it is secured into its final location. 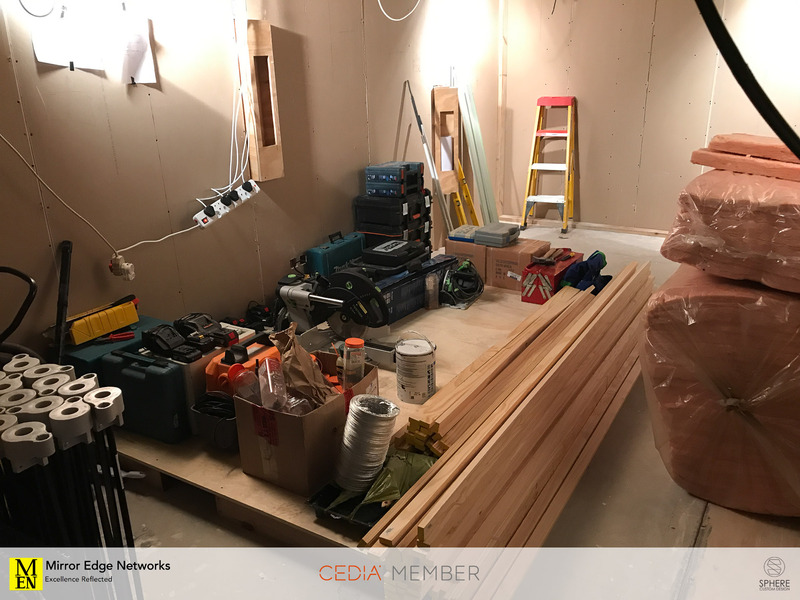 As can be seen, and as you can imagine… We have a serious selection of tools that we use to be able to make one of these installations a success. And of course this tool collection is ever increasing, its great to be able to do these sorts of projects and work with tools that you enjoy using. We were lucky enough to have a large courtyard which we were able to work in for cutting timber and preparing materials. However, there are always weather uncertainties. So our workshop moves inside while the weather is not suitable for us to be working outside. Joyfully we have suitable work benches and the room is able to accomodate us and allow us to carry on working effectively inside. You will notice the front baffle wall has received its coats of paint, even though it will eventually be receiving some acoustic treatment to it. This is done in any event to decrease the chance of reflections from behind the screen. 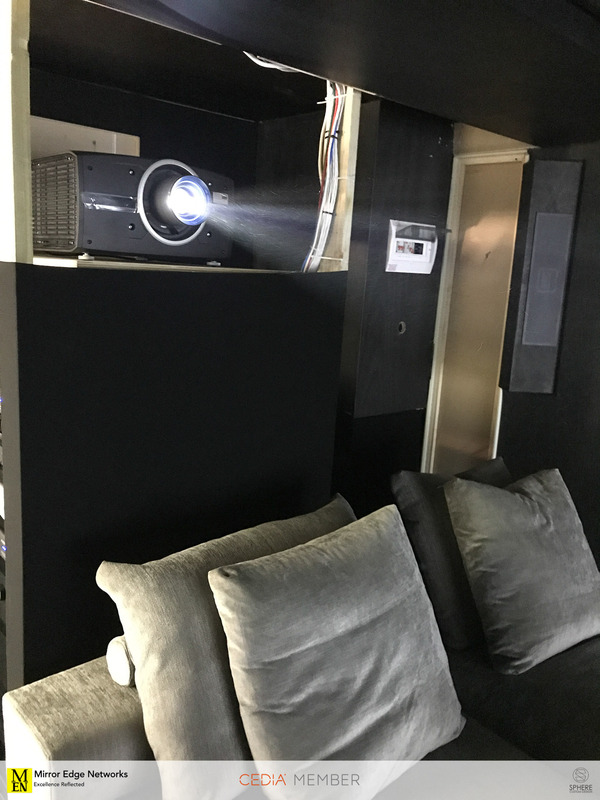 We are time-lapsing this home cinema build, the photos are located at various different locations within the cinema room. 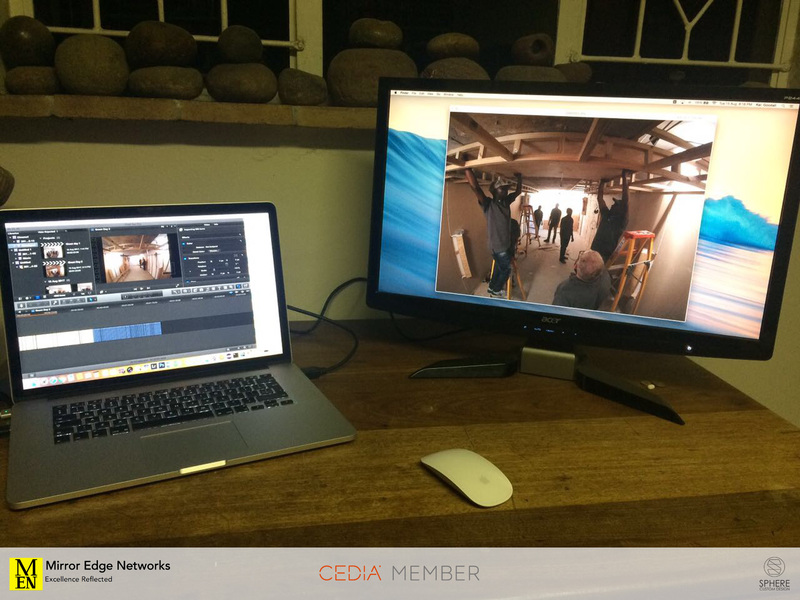 This is a quick photo update from Kai as he edits and compiles the photos for the timelapse. 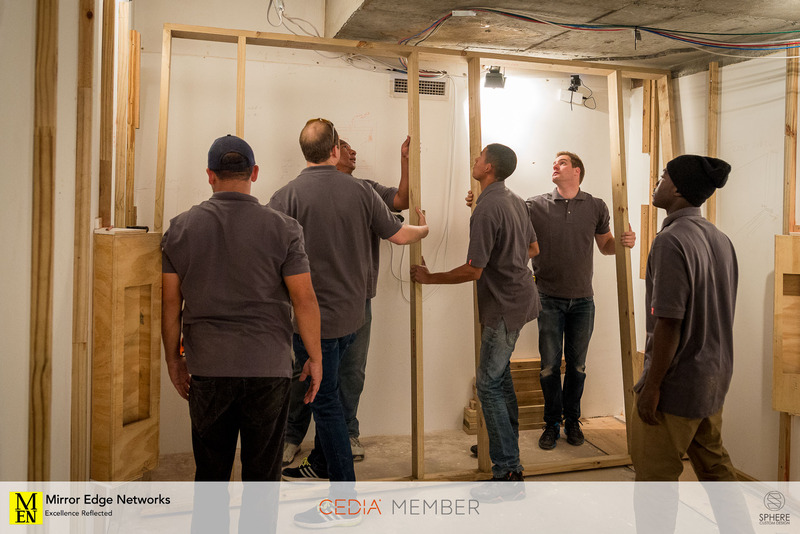 We finally start to get into the internals and finishing works within the home cinema room. Now that all the drywalling and bulkheads are completed we can start on the substructure for the Fabritrak. The main structure of the cinema is mostly complete. This includes the bulkheads, acoustic ceiling substructure, baffle wall painted and carpets installed. The day before these photos were taken the carpet layers came in to fit the carpet (pretty much just a standard high quality grey carpet). To ensure that the newly installed carpets are not damaged we install rubber matting over them so that work can continue without issue. In particular over the next few days is the fabritrak installation and painting of bulkheads. 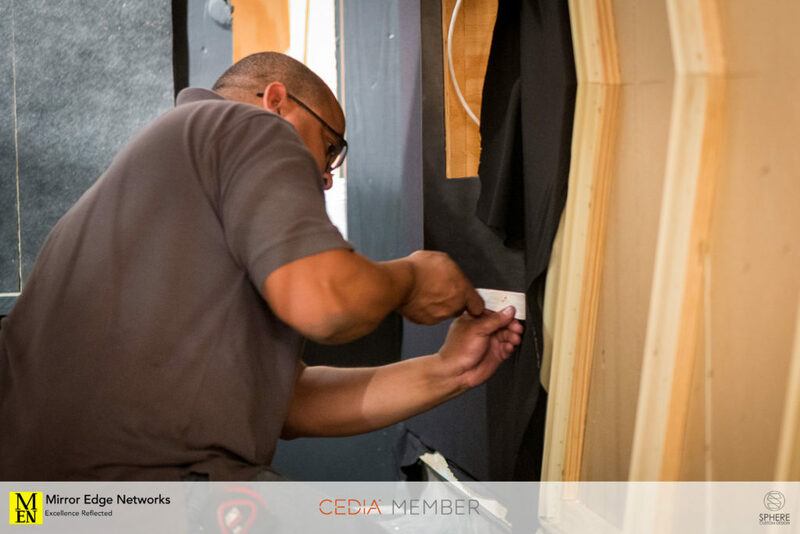 While the cinema room is being built we spend a few hours at the office on Saturday to build the equipment rack and install as many of the components as possible to ensure that correct cable management can be implemented. This also allows us to be able to check we have suitable cabling, the Trinnov Altitude processor to the initial Amplitude 8 uses a Tascam 25 pin connector as an example. The second Amplitude 8 and Wisdom SA2 subwoofer amplifier however uses XLR connectors. I am just adding links to the equipment that I think people would enjoy learning a little bit more about. Here you can see Christiaan and I unboxing and carrying one of the Amplitude 8 amplifiers to the workbench so that we can prepare to install it into the rack. These are serious amplifiers, they have two dedicated toroidal power supplies (the amplifier needs two separate power sockets to plug into) and is rated at all channels driven, 8 ohms: 225W RMS per channel. 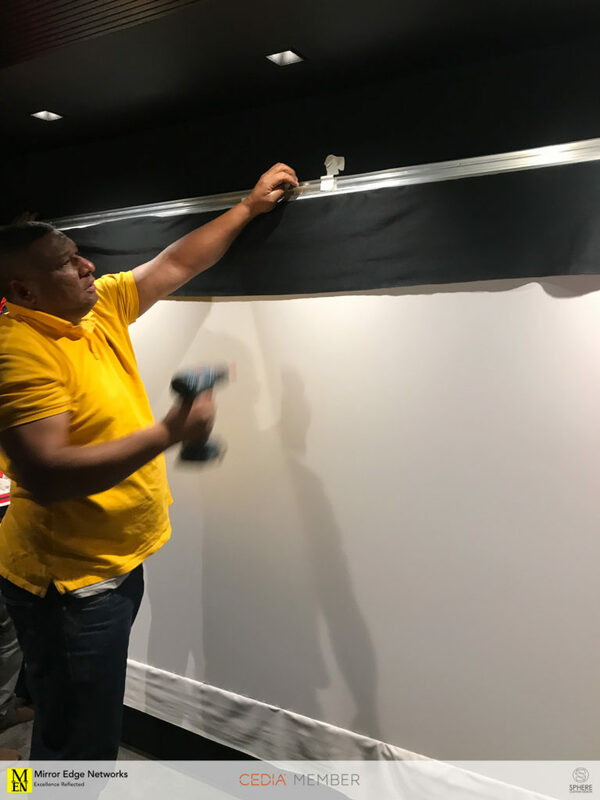 Fabric wall installation begins. This is being handled professionally by Alfonso, a time consuming, but incredibly beautiful way to finish a home cinema. 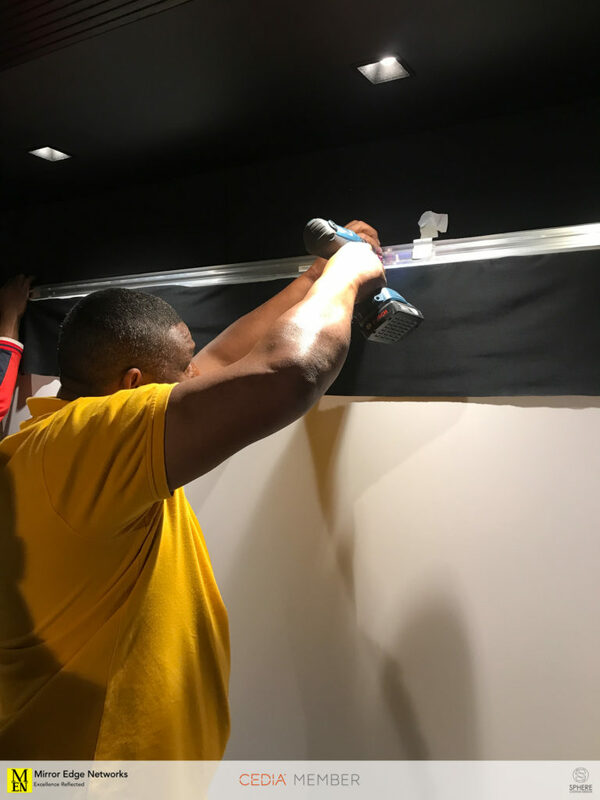 The process of installing the fabric walls takes almost two days to complete. 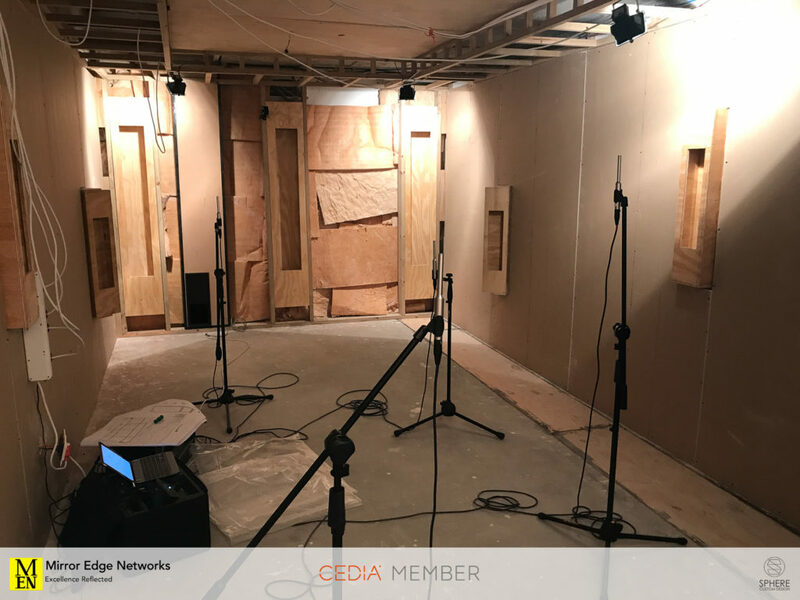 As we had some constraints in the room we needed to make sure that we optimised the space as much as possible, part of the method of doing this was using an acoustic ceiling. 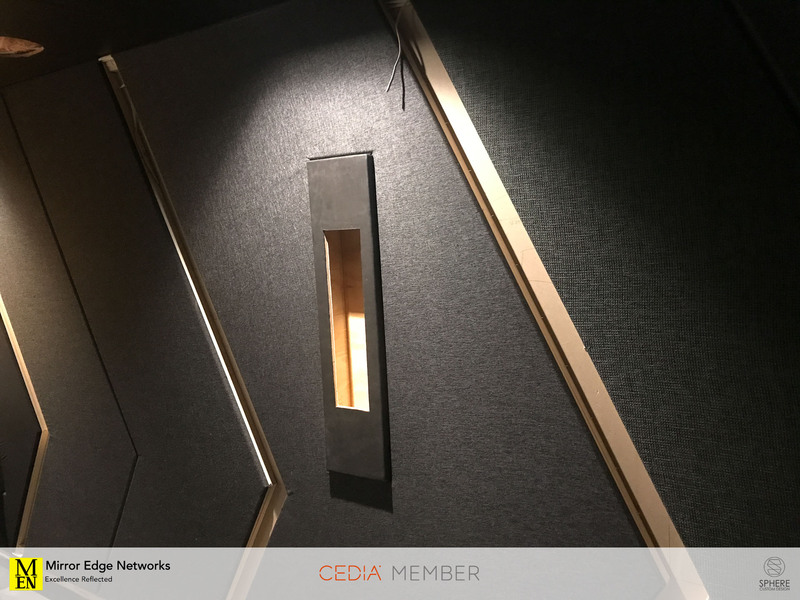 The acoustic ceiling boards were designed to be installed at an angle with LED strip lights across the top of them washing light into the room. 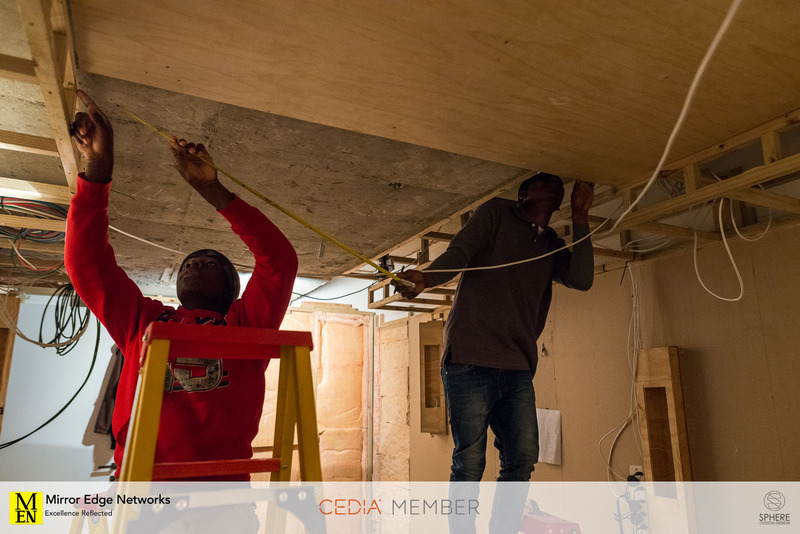 Included in the specific design of the ceiling installation is a shadow line along the sides of the of the ceiling. The installation process is quite a time and labour consuming one. 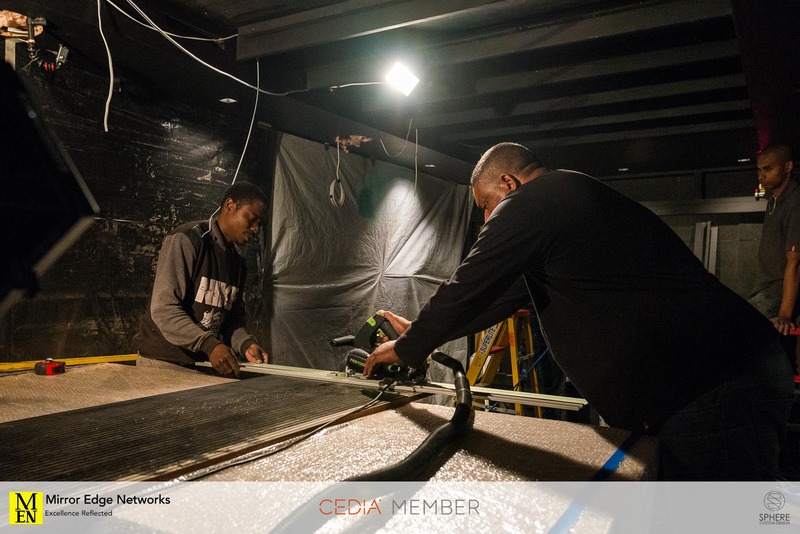 Not difficult because of weight factors, but rather the process of ensuring that all the ceiling panels are cut accurately to ensure that they leave the same size shadow line on the sides of the ceiling. 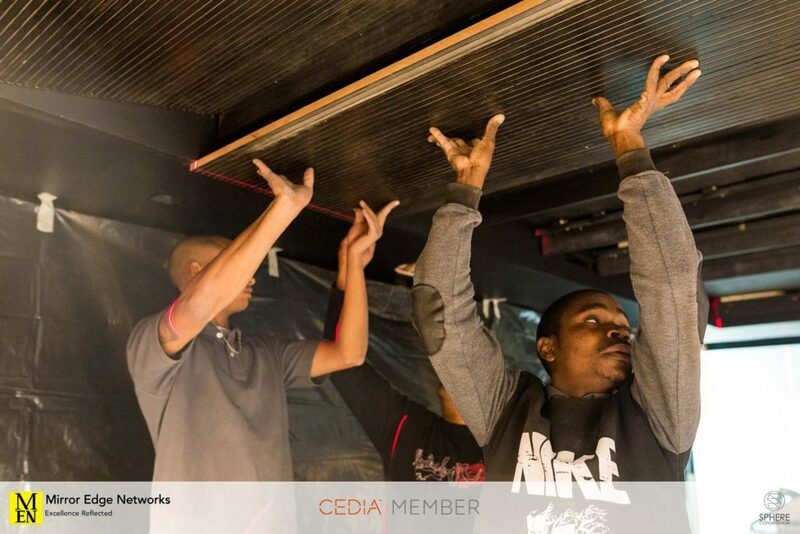 The process starts by lifting the acoustic ceiling boards into place and measuring their size against the laser. Finally they are lifted into place and installed. Once all the acoustic ceiling boards have been installed they will be stained again to ensure that any marks or nail heads that are visible from the nail gun (using a nail gun to secure them is the easiest method) are filled up and the ceiling boards look evenly coated. 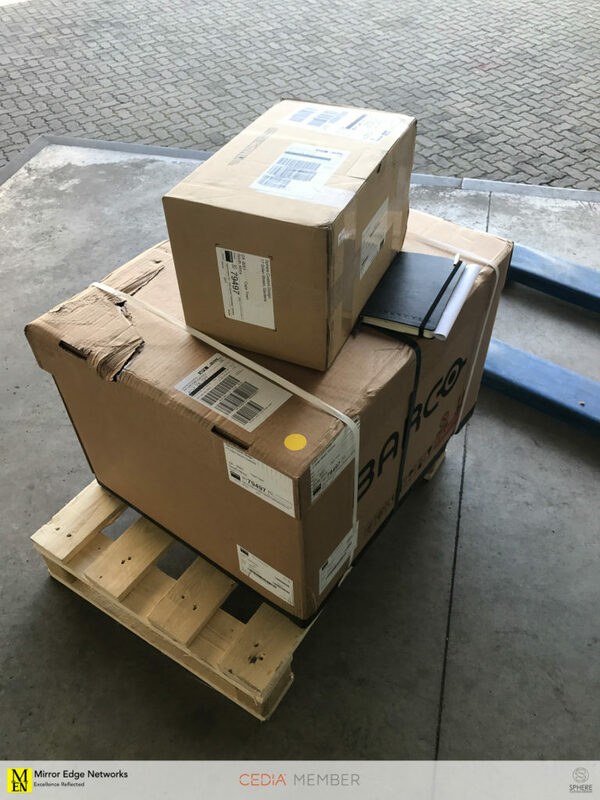 The Barco projector arrives in Cape Town. This was a bit of a stressful delivery, FEDEX didn’t want to go through the effort of delivering the projector through to our office on Friday afternoon. So while the projector was here in Cape Town, it seemed that while Customs checks and every other sort of pre-clearance was taking place that it was just out of our reach. I made the bold decision to jump in an Uber and muscle through Cape Town traffic at 3pm on a Friday to get through to the airport to collect the projector from the international airfreight offices. After about 15 minutes of waiting and processing of paperwork she arrived. 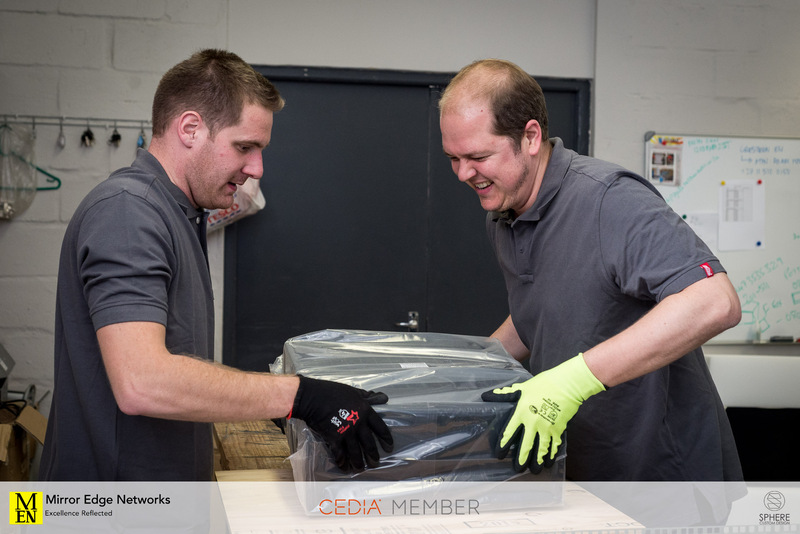 We were lucky, we were getting the Barco Balder projector and we would be able to deliver it through to site and make the cinema functional for the weekend! The equipment rack is delivered to the cinema, installed and connected. This is a first look at the power house of the home cinema in the room. There are a few other smaller items in the rack, an Apple TV 4K, Crestron MC3 processor, Araknis 16 port POE network switch, Rako lighting gateway. The DT Screens acoustically transparent projection screen is assembled and installed. 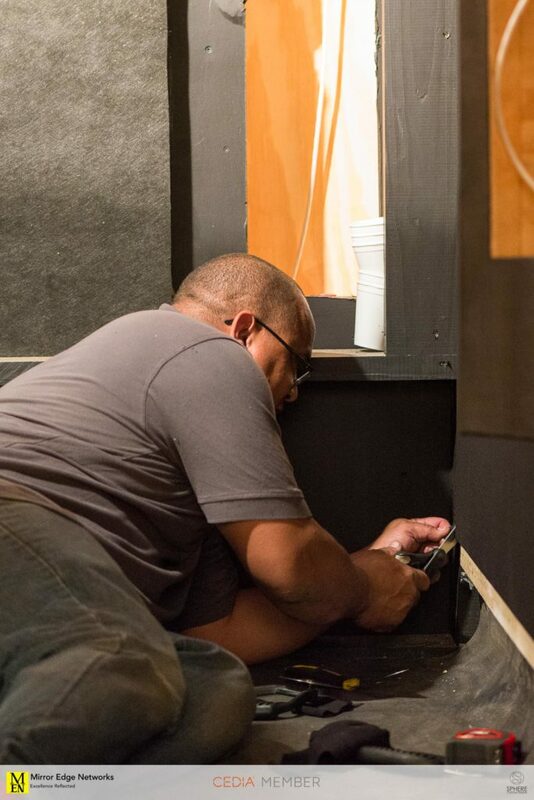 Here you can see Lionel taking great care to ensure that the screen is centred on the front projection wall. Lionel takes a step back to check and verify his measurements and location of the projection screen. Its starting to look a lot like a home cinema! This is the first photo of the cinema with the sofas unpacked and in their correct locations. The projection screen installed and all electronics connected. This is a great view of the home cinema with the back riser visible and the sofas in their correct locations. The Barco Balder is fired up for the first time! What an incredible home cinema projector! Once the chevrons were installed LED strip lights are installed behind them. This is a quick light detail photo I snapped just after they were connected & tested. Time to calibrate the room. Christiaan Beukes takes charge of the calibration process. This includes the placement of the special Trinnov calibration microphone in the primary seating position, the cinema is optomised for both the primary and secondary listening positions. 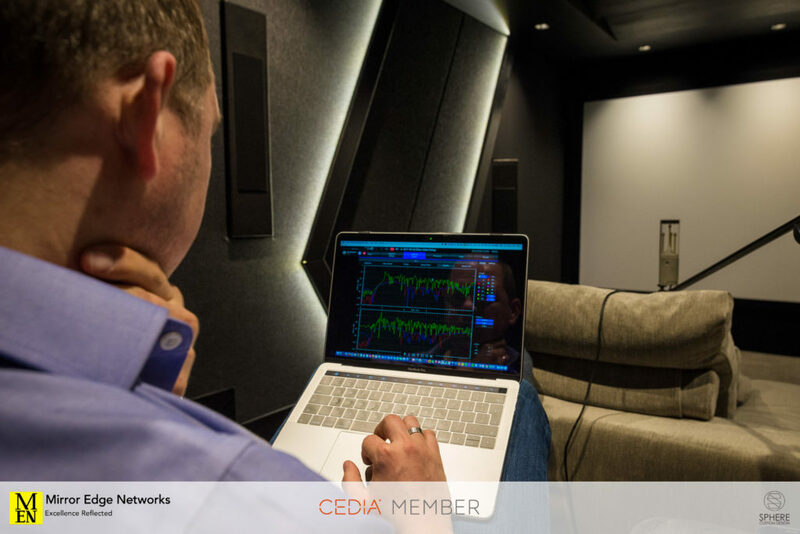 The first stage of the calibration process is the map the speakers within the room. The second stage of the calibration process is measurement of the acoustic properties of the room acoustically. Once this has taken place the processor can map the response of the speakers and equalize them according to the best response. The last stage of the calibration process is to set the suitable cross overs and response charts for the speakers. 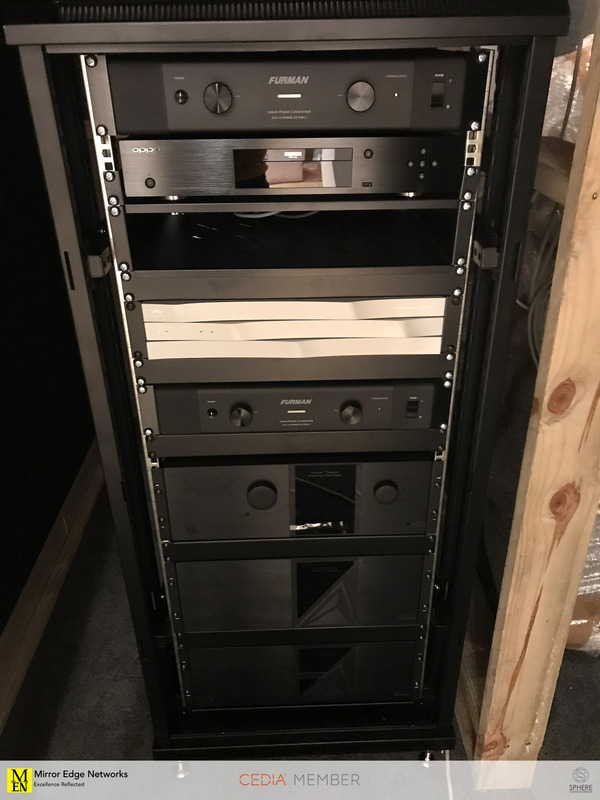 A quick preview of the completed rack installation. 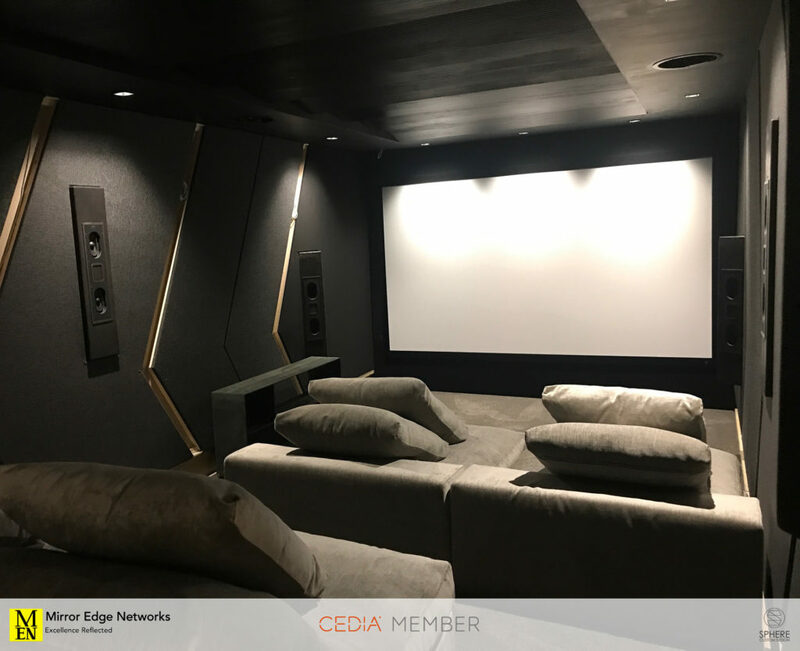 A final preview of the completed home cinema. This includes all construction details, but awaiting final curtain installation.